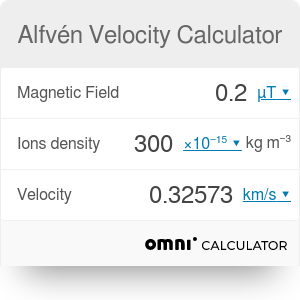 The Alfvén velocity calculator helps you compute the velocity of a magnetohydrodynamic wave, a type of a plasma wave. This kinds of wave appears for example in the Sun's corona or in the ionosphere. The Alfvén wave is a type of a plasma wave. You might know that plasma is an ionized gas. This means that it consists of charged particles. There are few types of waves that can propagate in plasma, one of them is the magnetohydrodynamic wave known as Alfvén wave. If you want to learn more about the waves in general, make sure to check our harmonic wave equation calculator. If we place plasma in an external magnetic field, we will observe the Alfvén waves. They come from balancing two factors. One is the inertia of plasma particles, second is the restoring force due to the magnetic field. Plasma particles are charged and are in constant motion. This means that the external magnetic field acts on them with Lorentz force. This Lorentz force is the restoring force that opposes the inertia of the particle. You can check the Lorentz force calculator to learn more about the Lorentz force. v [m/s] is the Alfvén velocity. For example, the Earth's ionosphere consists of plasma of the density around ρ = 10^(-5) kg/m³. The magnetic field in the ionosphere is B= 10 μT. The resulting Alfvén velocity is v= 2.821 m/s. Alfvén Velocity Calculator can be embedded on your website to enrich the content you wrote and make it easier for your visitors to understand your message.